An exceptional picture book biography of Margaret Wise Brown, the legendary author of Goodnight Moon, The Runaway Bunny, and other beloved children’s classics, that's as groundbreaking as the icon herself was—from award-winning, bestselling author Mac Barnett and acclaimed illustrator Sarah Jacoby. 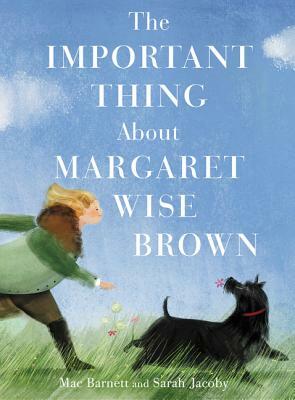 What is important about Margaret Wise Brown? In forty-two inspired pages, this biography artfully plays with form and language to vivdly bring to life one of greatest children’s book creators who ever lived: Margaret Wise Brown. Illustrated with sumptuous art by rising star Sarah Jacoby, this is essential reading for book lovers of every age. Sarah Jacoby’s illustrations have won awards from the Society of Illustrators (Gold Medal), Creative Quarterly, American Illustration, and Communication Arts. She is the author and illustrator of Forever or a Day. She lives in Philadelphia, Pennsylvania. You can learn more about Sarah at www.thesarahjacoby.com.